Franco started playing Volleyball after participating in soccer where he was a goalkeeper on his high school’s team. After moving and learning there was not room on the soccer team at his new school, Franco starting playing Volleyball. 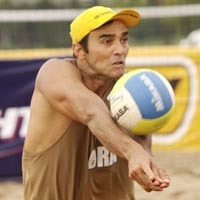 He began his Beach Volleyball career in 1989 and began competing on the SWATCH-FIVB World Tour with long-time partner Robert Lopes. The pair competed in the <?xml:namespace prefix = st1 ns = "urn:schemas-microsoft-com:office:smarttags" />Atlanta 1996 Olympic Games where they were seeded as the No. 1-seeded team. Franco has been a part of the No. 1 team on the Brazilian domestic tour three times (1993 and 1999 with Roberto Lopes, and 2004 with Tande Ramos).